The SCSI VUE Ultra SCSI Adapters, Connectors, and Gender Changers are designed with quality and reliability as their main features. 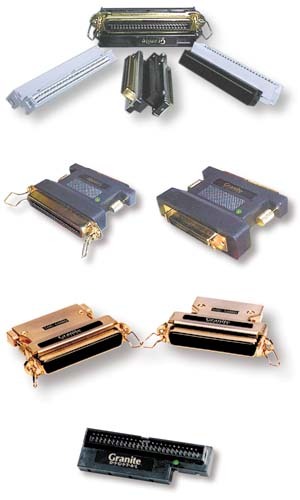 Components such as each contact having a Beryllium Metal Base plated with 30u of Gold. Other features include the use of Nano Flex Connectors that pierce each wire in four places rather than two like most other connectors. This added protection guarantees great contacts and added reliability. Termination components also make a difference in quality and Granite uses only Active Negated, High Precision Terminators. The cost might be more but the results speak for themselves. Only the best and forget the rest! Our Adapters are made to fit almost any need and are some of the most versatile on the market. This units come a lifetime warranty.